Do you find your hair becomes extremely high maintenance after you started dyeing it because your natural roots start showing in less than a month? Or maybe you have stopped going in for regular haircuts because you so desperately want your hair to grow past your shoulders. We totally get the frustration! You want nothing more than to see your hair grow but it just won’t seem to grow. So we are here to offer some of our insight on why your hair may not be growing as quickly as you’d like it to. On average, your hair should grow about half an inch a month. Meaning, the average person’s hair grows about six inches in one year. 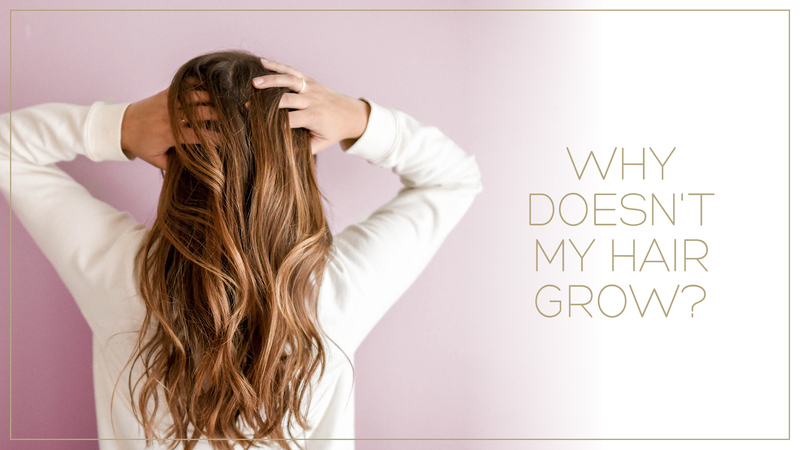 However, if you don’t take care of your hair, there are many factors that can contribute to hair breakage which will inevitably stop your hair from growing past certain lengths. Some of the main causes of hair breakage are over-processing your hair on a regular basis. This can include dyeing your hair, getting fresh highlights, or perming your hair. The continuous action of exposing your hair to chemicals gets rid of your hair’s natural oils which keep your hair healthy. This type of damage can make it almost impossible for your hair to grow past a certain length because the ends of your hair continue to break and split. 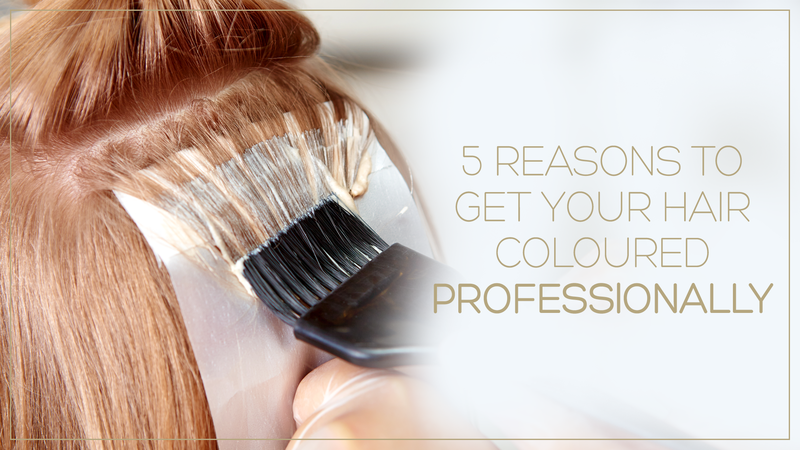 If you do start colouring your hair, be sure to see a professional so they can do a full examination and consultation on your hair. They will give you the best options and tips to keep your hair as healthy as possible while you expose it to chemicals. We all love to style our hair as much as the next person but, if you overuse hot tools or use them on a daily basis, they can cause major damage and affect the growth of your hair because using hot tools on your hair only accelerates the potential for damage by drying out and frying your hair. You can help prevent hair breakage by giving your hair the time to get back to it’s healthier and stronger self. Stronger hair can begin to repair itself and grow again. You know what that means ladies- flaunt what your momma gave ya! Did you know that tying your hair up in a top knot when it’s wet can actually damage your hair? The combination of wet hair being pulled tightly with uncovered elastics will cause hair breakage. If you have curly or coarse hair and continuously fight the natural way your hair wants to go, that will also cause breakage. Try using scrunchies when you want to put your hair in a ponytail, plus cute scrunchies are totally back in style in 2019! And definitely avoid tying your hair up in a tight top knot before it has had the chance to dry! If you find you have been giving these tips a try over a few weeks and still can’t seem to see a difference, come in for a consult with one of our professionals. Your hair may need a good trim to stop the ends from splitting, or maybe we can suggest a hair therapy kit with a better shampoo and conditioner to help repair the breakage. Whatever the case may be, our professionals are ready to help your hair get back to it’s healthier self and begin growing again. 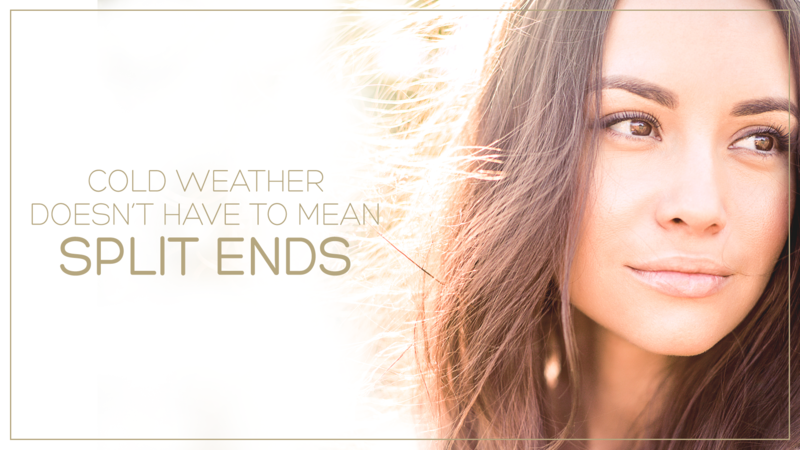 Winter is destroying your good hair days… one snowfall at a time. During the colder months of the year, the cold weather outside, combined with the warm temperatures inside, can cause breakage and split ends to your hair. This affects all types of hair during winter. However, we are here to help you through the winter season so you can continue rocking your gorgeous mane of hair. 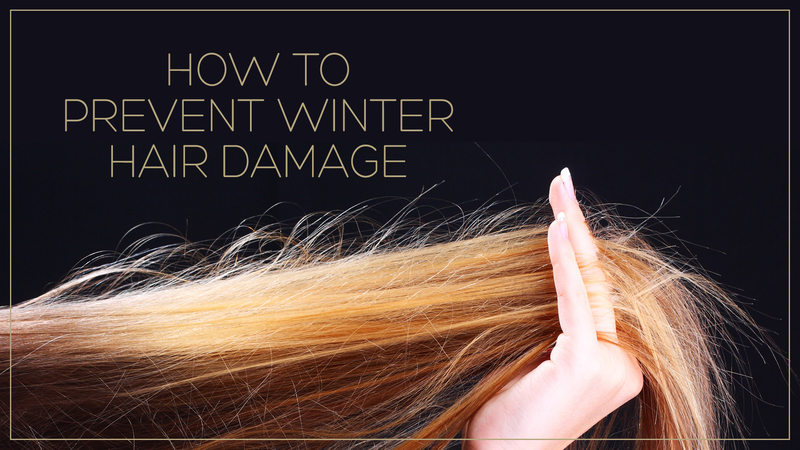 We have provided some helpful tips you can follow to prevent winter hair damage this season. The cool, dry weather can cause your scalp to feel very itchy and to become flaky. It is highly recommended to lighten up the amount of time you cleanse your hair with shampoo to prevent this from occurring. Constantly exposing your hair to the cool dry air is not good for any type of hair. Whether your hair is natural, curly, wavy, relaxed or coiled, it is sensitive to cold weather. Cold weather contributes to your hair becoming more brittle and more exposed to breakage, split ends, and frizziness. We recommend using an oil-based moisturizer to add extra moisture to your hair with the combination of using less shampoo. Cooler air also means no matter your hair texture, you should focus on seeing your hair stylist on a more frequent basis this winter. Your hair dries out during the winter from lack of moisture, which is why we recommend treatment therapy and good conditioners. Once a week, you should apply a good conditioner (preferably one recommended to you by your hair stylist) and let it sit in your hair for 30 minutes. The moisture from the conditioner helps repair the hair shaft. The constant heat and dryness from styling tools will inevitably result in breakage and split ends for your hair. Use leave-in conditioners to help treat your hair and embrace your natural style more in the winter time. You can also try to use more styles that don’t involve heat tools such as; buns, braids, twists, and ponytails. Although we are always busy in the mornings, it is actually critical to dry your hair before exposing it to the cold. It all comes down to basic science – anything that is cold expands, and that’s what will happen to your wet hair shaft in the cold weather. When hair expands, you are at a higher risk for hair breakage. It may also contribute to your hair colour fading quicker than normal. Take your time to make sure your hair is dry in the morning before leaving for work – your hair and wallet will thank you! These tips are an easy way for you to maintain healthier and happier hair and reduce winter hair damage this season. Take care and moisturize your hair like you do your skin during the colder months. At Caralyn’s, we are happy to help all of our clients with all of their hair needs. We look forward to seeing you for your next hair treatment! Fall isn’t just the season for pumpkin carving, lattes and oversized sweaters. It’s the perfect time to experiment with new fall hair colour trends. As the leaves change from green to gold, sunny summer highlights fade away to make room for darker shades of auburn. In this season of change and transition, it is time to embrace our own changes in hair colour. 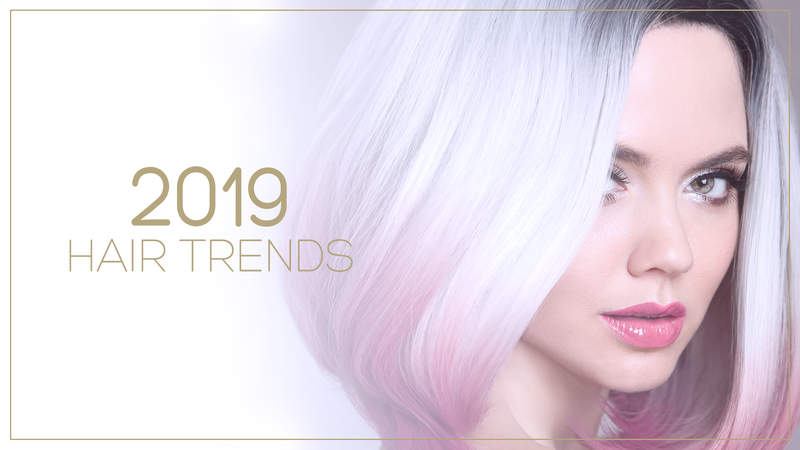 As we wave goodbye to the warm summer days and put away our floral dresses, let’s look ahead to fall 2018 to make sure we are embrace the latest hair trends. From there, we can consider which fall hair colour trends would suit us best. Be sure to book an appointment with us because we want to help you stay on top of fall trends! 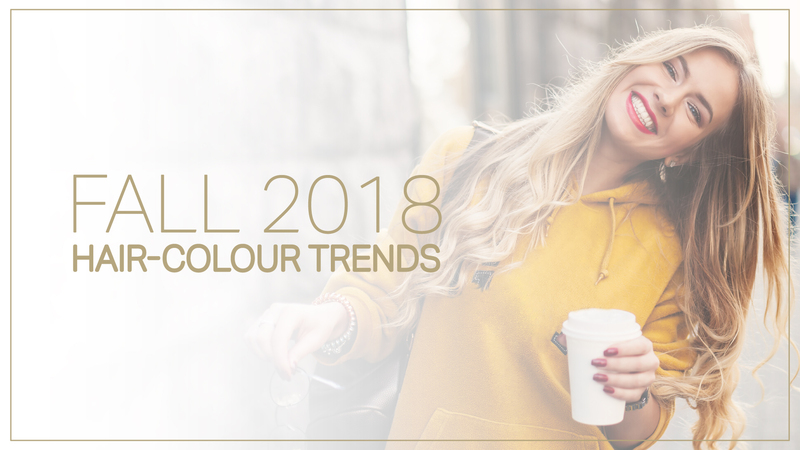 In this blog post, we will share 5 Fall Hair Colour Trends in 2018 for you to try out! Balayage is a perfect fall transition to a more natural, multi-tonal finish. Whether you’re blonde or brunette, It’s a great look if you want to refresh your hair colour but not go totally overboard. We are so busy in the fall season with back to school, so balayage is a perfect hair colour trend because it requires far less maintenance than a traditional colour. It goes out perfectly on its own and looks fresh for longer periods of time compared to a traditional colouring job. Why not try Balayage, the has been such a colouring phenomenon of 2018, so why not try it out before the end of the year? Lowlights are the complete opposite of highlights. Instead of elevating the colour in your hair, lowlights create depth and dimension to your hair. It’s a perfect look for fall because the lowlight accents are darker than your base colour and can contrast your overly-highlighted summer hair, giving it a more natural fall look. Lowlight options are available at our salon so you can transition your hair colour from summer to fall. According to beauty experts at Marie Claire, warm blonde shades have been on trend all year, but the perfect transition time is now. Blonde has never been more low-maintenance than it is now! Honey-Blonde Ombré acts as the ultimate fall grow-out disguise. A nearly-black hair colour like a goth brown hair is a perfect edgy fall colour. Celebrities like Jenna Dewan and Nina Dobrev are pulling off this colour. If you want it to be a more dramatic fall look (maybe around the Halloween season), be sure to add a smokey cat-eye to enhance your overall look. We are talking espresso, not pumpkin spiced lattes! Although, an espresso hair colour paired with a pumpkin spiced latte in hand would be a look for all! According to Giselle of Pierre Michel, brown hair colours this fall are leaning more towards more “woodsy” shades “from chocolate to espresso.” There has never been a better time than now to go dark. The change of season is the perfect time to embrace a change in your look; drastic or subtle. If we’ve convinced you to change up your hair for the fall season, be sure to book your appointment with us. Our dedicated team is here to keep you on trend so if you’ve been dreaming of your new fall look we are here to help.